Thank you for your interest in joining iMediChart, Inc. We help our subscribers plan logically their medical data , so that they can reduce or eliminate medical mistakes in emergencies and during regular Doctor visits. Thank you for reading this entire listing before applying. Pay: Base Salary DOE + Benefits, + Bonus, +Generous Commission, + Possible Stock Options After 1 year. Our company is an innovative young minded, positive, upbeat and entrepreneurial start up with an exciting and positive climate that prevails.We offer one of the most sought out emergency medical information system. See our website www.iMediChart.com for more about what we do. We are very passionate about what we do and expect you to be the same. We need someone who can come in and take charge of an assigned territory with minimal training. You should be a responsible, well-organized, goal-oriented, committed, individual who can assimilate well into a small and youthful office environment. Duties: Prospect, Follow Up On Leads, Open B2B and individual accounts. Applicant should be proficient in general computer applications, including Microsoft Word, (Have basic knowledge) Quickbooks, Excel, E-Mail, Internet, etc. Should be able to compose and type general business correspondence. Should have sufficient accounting knowledge to handle payables and receivables. Experience in the health care industry/marketing business a plus, especially customer relations, credit approval and collections. Pay: Generous Commission,+ Bonus, + Possible Salary and benefits based on performance. 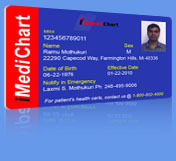 iMediChart.com offers one of the most sought out emergency medical information system. We are looking for a self motivated individual to develop new business for iMediChart. You need to be highly creative. Be the type of person who can come up with great ideas. You need to be the type of person who can get things done. You must be willing to work on a commission at first. If you do a good job, you will be paid a salary in addition to your commission. We need someone who is willing to work from their home office or our office in Troy. We have big ideas, and big dreams. Now is the time for someone like you to get on board and help iMediChart get to the next level. Be a part of something huge. Apply now. Send us your resume and tell us why you want to work with us and what you can do for us. Check us out at www.iMediChart.com. Positions are open through out the US.